Note on Digital Perusal: Samuel French's new digital perusal process grants easy, digital access to music perusals while protecting the intellectual property of our composers, book writers, and lyricists. Samuel French perusals are intended to be used for finding the perfect show to fit your theater, casting pool, and resources. Perusals should be used to get acquainted with the music and script. They cannot be used to hold auditions, produce the show without a license, or find sheet music for a separate performance. OVER 300 PERFORMANCES OFF BROADWAY It's London, 1944. 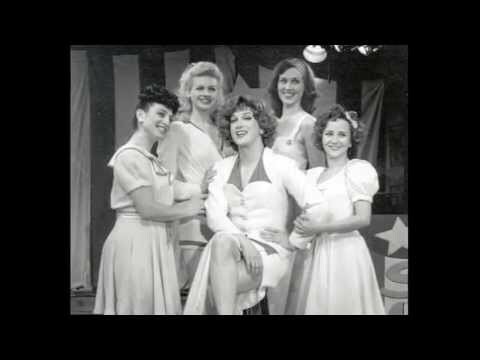 Join MGM star Marian Ames and her all-girl band from the Hollywood Canteen for the rip-roaringest canteen show of them all. After 17 years with MGM, still-glamorous movie legend Marian Ames has endured four flop films in a row and is being put out to pasture. But this is 1944 and no time for self pity. So Marian has gathered up her instrument playing gal pals from the Hollywood Canteen and headed for London to entertain the troops. Joining her are Jo Sterling, (her drum playing stand-in on 17 pictures), her skittish niece Katie Gammersflugel, solid as a rock piano playing riveter Topeka Abotelli and leggy chorine Lilly McBain. Get ready for a memorable night as these five archetypal film characters from the 1940's prove their mettle while they sing over 30 vintage classics from the war years. Laughs, tears, emotional fireworks, air raids and a celebration of women during the war punctuate this hilarious and heart warming story. Songs include: "Don't Fence Me In," "I'll Be Seeing You," "Sing Sing Sing," "How High the Moon," "I Don't Want to Walk without You," "A Nightingale Sang in Berkeley Square," "Ac-Cent-Tchu-Ate the Positive," "Sentimental Journey," "Apple Blossom Time", a fast paced, 12-song Andrews Sisters medley and many more. Setting: Swingtime Canteen is designed to be performed on a single unit set. The set is a USO show being performed on the stage of a London music hall in 1944. It features such period iconography as war posters and bandstands. Swingtime Canteen is designed to be performed by a company of 8 (5 actors and 3 side musicians).Of the five roles in the show, only three play an instrument. The script is easily revised to suit the casting pool available. The show utilizes three side musicians who are on stage during the performance dressed as WACs. This allows the theatre to engage professional musicians for instruments not found in their casting pool. Swingtime Canteen opened Off Broadway at the The Blue Angel Theatre in February 1995 and ran for over 300 performances before hitting Atlantic City and London.